Do you experience challenges with the process of window washing around your property? Your struggles are not enough to wipe stains, water streaks and dust build-ups from glass surfaces? The experts of window washing in Hackney Wick will render you assistance! Say goodbye to the countless hours of polishing and wiping – the skilled and experienced team members will manage this burden. You will be able to enjoy your free time – just let us do this slow and tiresome task for you. Our professional approach will grant you lots of perks. We also provide our professional services in nearby areas: Homerton, Higham Hill, Kingsbury, Hanwell, Colindale. The technicians have the abilities and the needed equipment to provide you with both residential and commercial window cleaning. You can rely on us for every kind of glass surface cleaning. For example, we can wash small or double windows, French doors, sash windows, bay windows and patio doors. Moreover, if you have garden glass surfaces, greenhouse or skylights, we can clean them as well. We use the latest techniques and the most advanced equipment for all the previously mentioned window types. You will have perfectly looking workplace with the help of the adepts of commercial window cleaning. You can depend on our first-rate services for all kinds of business premises. 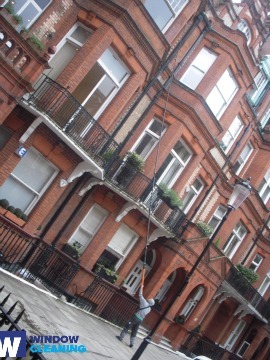 For example, if you own a small shop, we can carefully clean its windows by using water fed extension pole system – it allows us to reach up to the fourth floor. If you search for spotless look for the glass panes of a tall business property in London and the surrounding areas, we will put in use our rope access gear. In any case, you will get excellent results in no time. We provide top-notch window cleaning by using latest techniques. We deliver impeccable and absolutely clean look for your glass surfaces, roof windows and greenhouses with water-fed extension pole system and jet washing. The poles we use are attached to water reservoirs in our vans, thus excluding the risk of damage to the exterior of your home or business premise. What's more, we use completely safe rope access equipment to clean glasses on tall buildings. You can benefit from these techniques instantly – call us on 020 3746 3113! The experts of window cleaning in Hackney Wick will revive your dwelling. We offer excellent window cleaning services in Hackney Wick. Our routine includes water fed extension pole system and also jet washing. We keep your health and safety with eco-friendly solvents and purified water. Join our satisfied purchasers – dial 020 3746 3113 and speak with our customer support centre. You can also request our services on-site – just fill in our booking form or use our chat feature.